The Shanghai Ballet is currently in Charleston. The Charleston Concert Association opens its 2013-14 season with the renowned Shanghai Ballet, in a production that weaves the grace and splendor of Chinese culture into classical ballet. “The Butterfly Lovers,” a tale of a young couple’s ill-fated romance expressed through impressive choreography, spectacular costumes, and fanciful sets, is often called the Romeo and Juliet of Chinese folklore. This internationally acclaimed ensemble brings with them over three decades of skill and flair, and a repertoire that spans western classical ballet, Chinese national ballet and modern ballet. 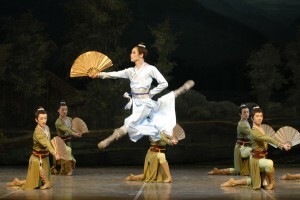 The Shanghai Ballet last performed in Charleston to a near sold-out Gaillard Auditorium exactly eleven years ago on the CCA’s 2002-2003 season. Tonight’s performance starts at 7 p.m. and will be held at the Sottile Theatre. Season tickets range from $190 to $390 and can be purchased by calling 843.727.1216. Purchase individual tickets through TicketMaster (800.745.3000 or www.ticketmaster.com) or at the CCA office at 131 King Street, Charleston, Monday to Friday 9 a.m. to 5 p.m. Visit www.charlestonconcerts.org for more information.